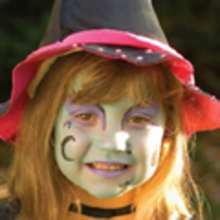 face painting colors: green, red, white and black. Using a sponge, apply green color to your whole face, making sure the model's eyes are shut. You can also color your hair! Clean your sponge. With the brush and red color, draw the eyebrows on your forehead, curling the ends down onto your nose, Draw 2 lines across each cheek and crease lines at the corner of each eye. Clean your brush. 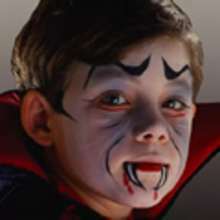 Using the brush and white color, add fangs at each corner of your mouth and draw a line as a highlight on each eyebrow. clean your brush. With black color outline the fangs and paint your lower lip. On the top lip add short lines to create the effect of creases. Paint end of your nose and add the outlines above the eyebrows. Finish by adding dots all over your face. You look like frigthening green monster!